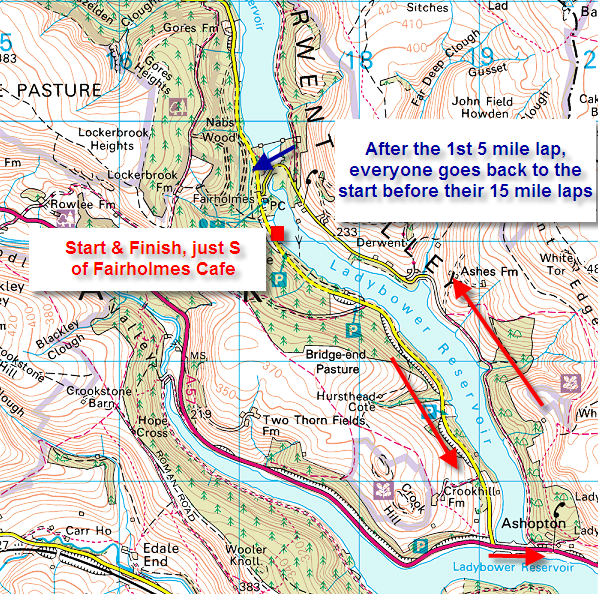 Feed the Warrior’s Ladybower 50 race scores high on headbanging quality! 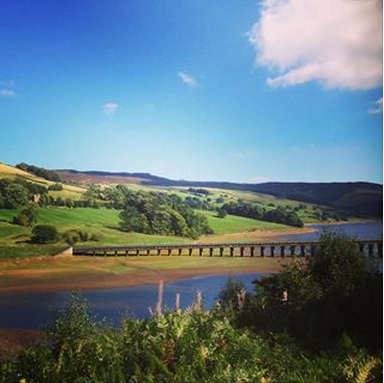 Three races are on offer, consisting of laps of Ladybower (5 miles) and Ladybower plus Derwent & Howden Reservoirs (15 miles). So everyone starts with the 5 mile lap and then you can either do 1, 2 or 3 laps of the whole thing to add up to 20, 35 or 50 miles – ingenious! There’s a gazebo at Registration where you can leave food and drink as you pass this point 3 times on the 50 mile race. But parking is en route very close by so I just used my car. 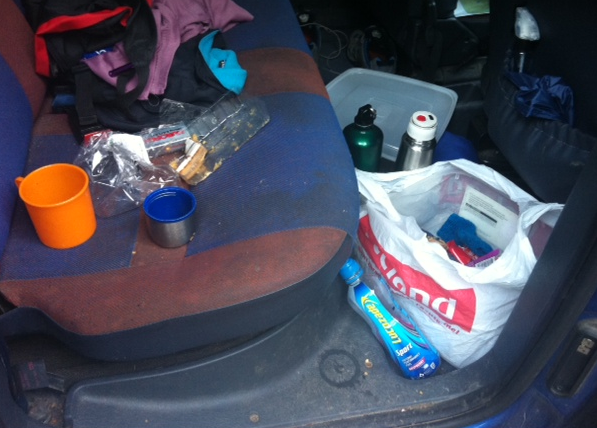 I could run with a small bumbag but had coffee, wraps & cake at 20 & 35 miles! 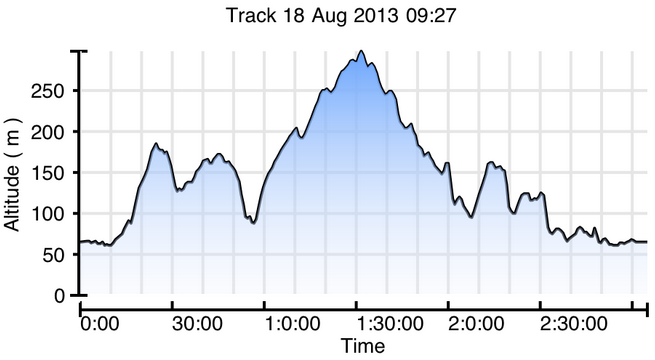 We started at 8am for the 50 miler, the 35 & 20 milers at 15 min intervals behind us. 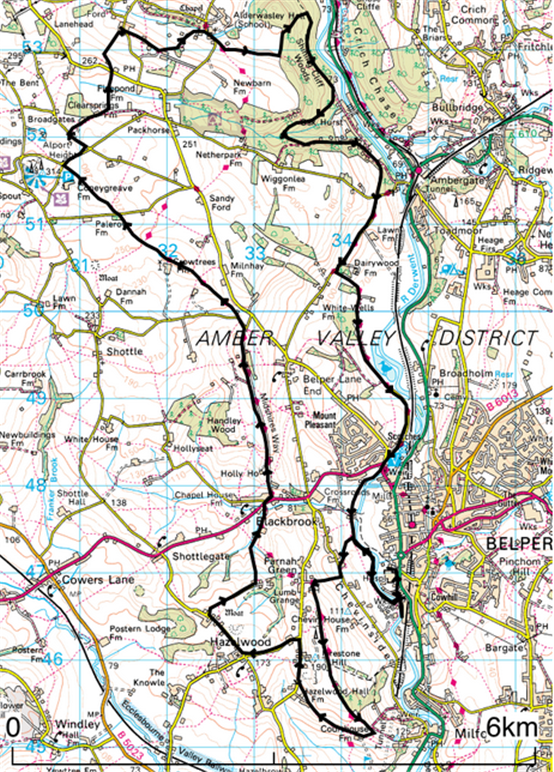 The route headed down to the Ashopton Viaduct on a nice undulating forest track and back up the E side of the reservoir on a minor road. Where the track forks, a marshal sends you back to the Start (blue arrow) and you repeat that lap but the 2nd time continue round the whole reservoir. This was quite nerve-wracking as you run 10 miles but feel you haven’t really started on the race proper! The 1st 5 miles took me 50 mins carrying no water and I did a quick bumbag swap at the car for my bumbag that holds a 500ml bottle right way up (but chafes!!). 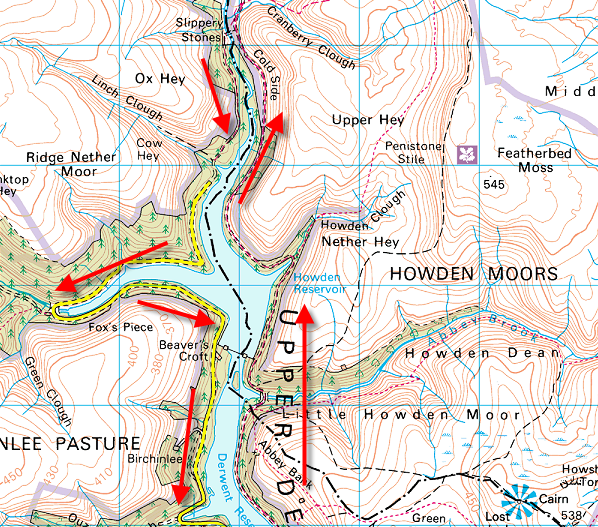 So round the bottom of the lake again but this time taking the right fork to go round Derwent Reservoir and Howden with its fearsome arms. It was great to finally start on this leg as I felt I was getting proper miles under my belt at last, even tho I’d already done 10 miles. It was also the prettier part of the route, especially the upper part by Slippery Stones – I promised myself a family picnic there next year! The big bay on the top left looked enormous as I swang into it but it was cleared in 15 mins then it was mainly downhill to sustenance in the car…. That 15 mile lap took just under 2 1/2 hours, so I was thinking 3 hours for the next one and 3 1/2 for the final one, maybe stopping to take some photos. In fact I did both laps in 3 hours, bringing my finish time to 9hrs 18. Got a bit of a boost on the 3rd lap from the thought that I wouldn’t have to run it again as it was beginning to feel like a very pretty version of purgatory!!! 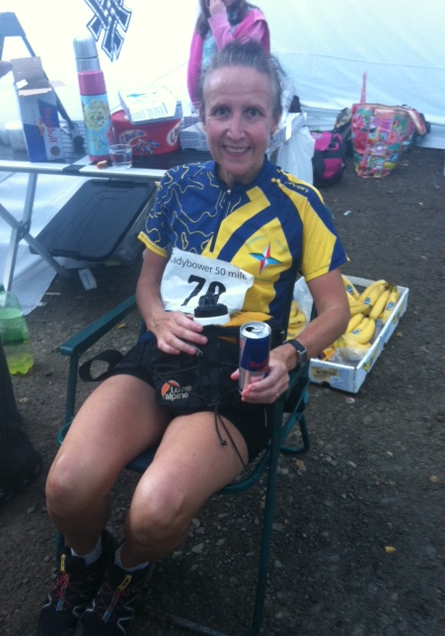 There was a great cheer at the Finish, then – bliss – deckchairs, Red Bull and chips. I asked on the race’s Facebook page if anyone knew the amount of climb and Stephanie had run round with a GPS and got 4050 ft! This seems like a lot, so I’m hankering to do a 50 mile canal race (probably Glasgow-Edinburgh again in the spring) to see if a flat course gives a faster time. I must say it was a real pleasure doing a 50 miler without stiles, electric fences, stampeding cattle or navigation issues!! Add the benefits of great scenery, support & organisation … still not sure if I’ll do it again next year tho! This is a friendly race in our home town so we do it most years. It’s 18 miles and 2116ft up, first, The Chevin and then Alport Heights, coming back thru Shining Cliff with a sting-in-the calves climb!